Adelaide Duo / Band 520 – Phat funk, cool jazz, drenched in soul, sparking with energy and pulsing on the dance floor. This is the sound of Adelaide Duo / Band 520 – providing the essential soundtrack to any great celebration. It’s a band with the ability to add its own distinctive flavour, keeping the sound fresh, vibrant, delicious to the ears and directly connected to the audience. Diversity is the great strength of Adelaide Duo / Band 520. The versatile five-piece band’s broad love of music and the performers’ rich experience allows them to effortlessly embrace myriad styles. The result is a sparkling performance, built on the highest calibre musicianship and soaring vocals. Adelaide Duo / Band 520 also loves to have fun, and pulls together a big blast of party music from the widest possible spread of hit makers – from the spanking Motown sound of Stevie Wonder and Michael Jackson, to phat soul from Beyonce and Amy Winehouse, fizzy dancefloor pop of Bruno Mars, Prince and Maroon 5, and the edgy vigour of INXS and Ben Harper. If the occasion demands more intimacy, Adelaide Duo / Band 520 can perform as an acoustic duo, focusing on the pristine beauty of songs. The pure mesh of voices and melodies offers an ideal soundtrack for ceremonies and memorable occasions, melding poise and energy with elegance. 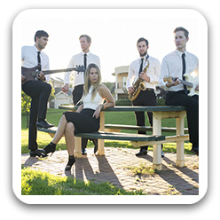 Adelaide Duo / Band 520 delivers premium entertainment and an irresistible sound to ensure satisfied customers – providing all types of music, for all types of occasions. Can perform as a: Duo and 5 Piece Band and are available to perform in Adelaide and Surrounding Areas. Band 520 did an absolutely fantastic job on Saturday night for our company Christmas Dinner. Everyone was extremely impressed with their music – all the feedback has been positive and some would like to book them again next year. They did what we asked keeping the music to a soft level throughout the dinner and then cranked it up towards the end. Extremely polite and accommodating, highly recommended for any event!! We highly commend the outstanding work of 520 – Duo at our recent event held at Ayers House, Adelaide, on 15 May 2016. They were prompt in response, easy to work with, aligned to the objective of our event and most importantly, great entertainment. Not only were they very professional, they worked well with our staff, the venue and provided a range of music to suit the varying crowds throughout the evening. I have no doubt in recommending 520 – Duo for any corporate event. I would most definitely have them perform at any of our events again – thanks again!